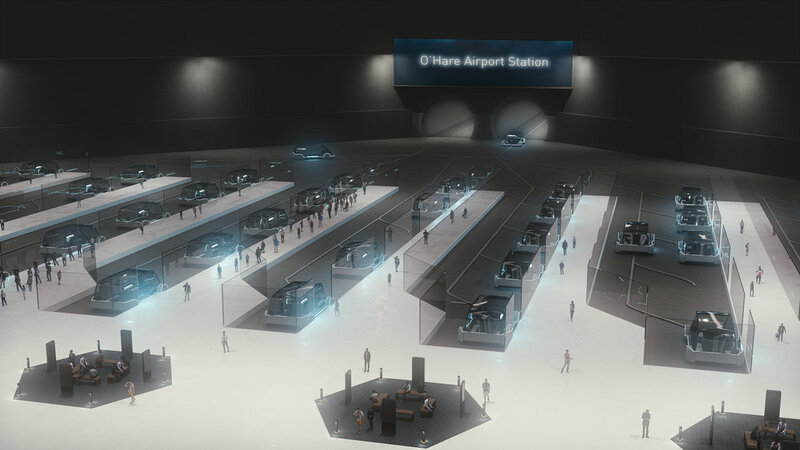 The Boring Company has been selected by the Chicago Infrastructure Trust (CIT), on behalf of the City of Chicago, to enter into exclusive negotiations to design, build, finance, operate and maintain an O’Hare Express service. The Chicago Express Loop will provide fast and convenient transportation between O’Hare Airport (Terminals 1-3) and Block 37 in downtown Chicago. The Boring Company aims to alleviate soul-destroying traffic by constructing safe, affordable, and environmentally-friendly public transportation systems. The Chicago Express Loop will run between O’Hare Airport and Block 37 in downtown Chicago. Loop is a high-speed underground public transportation system in which passengers are transported via compatible autonomous electric vehicles at up to 155 miles per hour. See FAQ for additional information. Safe. AEVs are based on the Tesla Model X, recently named the first and only SUV to achieve a NHTSA 5-Star safety rating in every category and subcategory. High-speed. AEVs can travel at speeds of up to 150 miles per hour. All-electric. AEVs are battery-powered, zero-emissions vehicles. No surface noise and vibration. Tunnel construction and operation will be silent, invisible, and imperceptible at the surface. No communities divided with lanes and barriers. TBC will not use public surface right-of- way for construction or operation of its system. Comfortable and convenient for passengers. Higher speeds and straighter alignments are possible due to fewer subsurface right-of-way constraints. Weatherproof. Operation is unaffected by weather. The Boring Company. This project will be 100% privately funded. It will take 12-minutes to travel from O’Hare to downtown. The Chicago Express Loop is three to four times faster than existing transportation systems between O’Hare Airport and downtown Chicago. The fares are not finalized but will be less than half the typical price of taxi/ride-share services, though higher than the Blue Line. What are the amenities on the AEV? Each AEV features a climate controlled cabin, luggage storage space, and Wi-Fi. How frequently will the AEVs leave the station? AEVs will leave each station as frequently as every 30 seconds. The Chicago Express Loop will operate 20 hours per day, every day of the week. Comments, questions, and future station suggestions can be emailed to chicago@boringcompany.com. We will expand this project page over time to reflect the questions received.